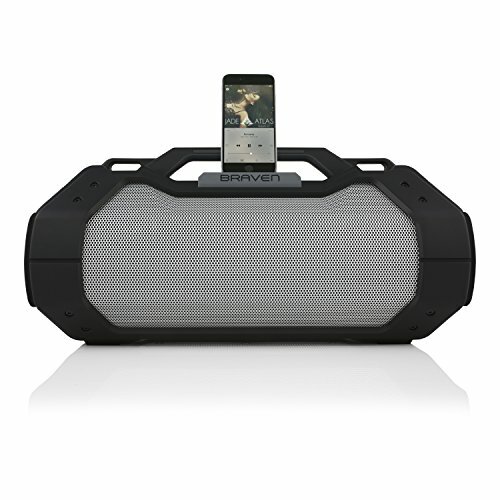 Braven BRV-XXL portable Bluetooth speaker is our largest and loudest speakers to date. With 4x the standard amount of HD audio drivers, the BRV-XXL is the best speaker for even your biggest parties. Wirelessly connect, play, and talk from up to 33ft (10m) away with crystal clear sound. The XXL doubles as a power bank featuring the unique capability to charge any device with its built-in 15,600mAh USB battery port. With its rugged design, the BRV-XXL is completely weatherproof which keeps it safe from water, sand, dirt, and even accidental falls. Take your speakers outdoor, indoor, or anywhere in the world without ever worrying about ruining it. The biggest, baddest speaker in the outdoor BRV line, the BRV-XXL is sure to rock the house or make you the MVP of the tailgate party. Built for any weather condition, the rugged design is completely Water Resistant, Dirtproof, & Sandproof. 33ft (10m) Wireless Range with Advanced Bluetooth Technology allows for clear crisp sound anywhere you go. Even connect wired through the 3.5mm stereo input AUX port. This massive speaker is built with 4 HD Audio Drivers, 1 Subwoofer, and 14 hours of uninterrupted playtime to ensure for rich full sound all night long. Portable and convenient, XXL features built-in 15,600mAh portable charging capabilities for any smartphone, tablet, or USB enabled devices while you're miles away from a plug. Carrying strap with bottle opener included. Take your party to the next level and boost your voice with the 3.5 microphone input to ensure that your voice is heard. If you have any questions about this product by Braven, contact us by completing and submitting the form below. If you are looking for a specif part number, please include it with your message.